Otus is a fantastic learning management system (LMS) that I've watched mature from its early iterations as an iPad-specific tool to a full-fledged LMS. This week, the folks at Otus announced a new round of updates to their LMS. 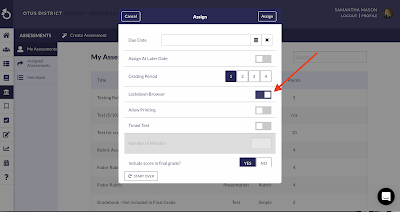 Included in those update is a new lockdown browser mode that can be activated when students are completing an assessment delivered through Otus. Lockdown browser mode will keep students locked into the assessment until it is completed. As you can see in the screenshot below, there are also options to restrict printing and to assign time limits. Other updates to Otus include a redesigned lesson builder, more reporting options, and more options for updating student profiles. The lockdown browser mode is one that a lot of teachers ask for. In fact, on Monday night I answered an email from a reader who was looking for a tool that would do exactly what lockdown browser mode does in Otus. Using lockdown mode could help to reduce the chances of students opening a second browser window to search for answers while completing an assessment online. If you're going to be at the ISTE conference next week, stop by the Otus booth to see lockdown browser mode in action.